Juegos De Argel, S/N, 04131 Retamar, Spanien. 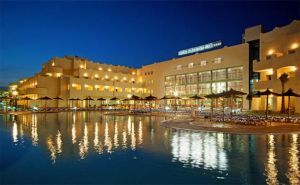 Hotel Alcazaba Mar is a family hotel in Almeria. The hotel was built in 2006 and it is located at 15 kilometres from the city of Almeria and very close to a golf course and at just 200 metres from the beach. During the summer, the hotel has a bar by the swimming pool. It also offers a miniclub for kids and activities and games for them. The establishment is placed in the surroundings of El Toyo, a recently created villa to hold the sport people for the 15th Mediterranean Games in 2005.